Does having a cat increase the risk of psychosis in humans? House cats are often carriers of the parasite Toxoplasmosis gondii. Epidemiological and animal studies at least suggest an increased risk for schizophrenia following in utero or early childhood exposure to the parasite. There may be such a connection, but mere ownership of a cat during pregnancy or in early childhood does not increase the risk of psychotic events when children reach age 13 or 18, wrote Francesca Solmi, Ph.D., a postdoctoral research associate in psychiatric epidemiology at University College London, in a study published yesterday in Psychological Medicine. Solmi and her colleagues used data from the Avon Longitudinal Study of Parents and Children, based on an initial cohort of 16,734 pregnant women in southwestern England who gave birth in the 13 months after April 1991. The study assessed 6,705 children at age 13 and 4,676 at age 18. 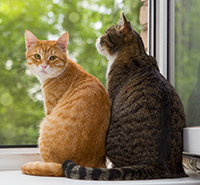 After adjustment for several potential confounders, they found no evidence that cat ownership when the mothers were pregnant or when children reached age 4 or 10 was associated with psychotic symptoms at ages 13 and 18. Previous studies that have concluded otherwise may have been compromised by small convenience samples, retrospective design, and lack of control for some confounders, said Solmi. “While pregnant women should continue to avoid handling soiled cat litter, given possible T. gondii exposure, our study strongly indicates that cat ownership in pregnancy or early childhood does not confer an increased risk of later adolescent psychotic experiences,” she concluded.